SO this one time.....my little brother Austin made me laugh the hardest I think that I have EVER laughed!! Cath was getting ready for girls camp one evening and had some things out of the counter. So he walks in, picks up the "Neo to Go" and just squirts it right into his mouth (I am staring at him this whole time) and he gets this look on his face like "What the hell did I just squirt into my mouth??" (Excuse my french, but seriously). He then FINALLY decides to look at what he so willingly just squirted into his mouth. 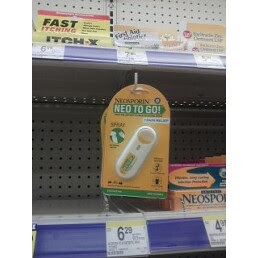 NEOSPORIN!! He then freaked out and ran into the bathroom completely traumatized. Me, Cath, and Dave were seriously ROLLING on the ground laughing!